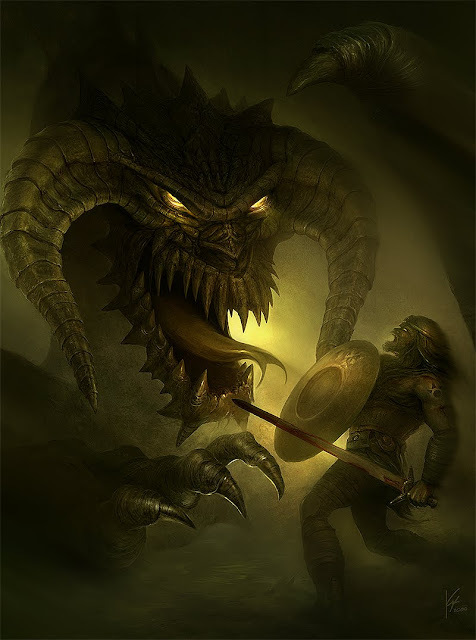 While D&D Dragons often are just big monsters to be killed in the last room of the dungeon, many mythologies connect dragons with the Gods. But Divine Dragons have always been a part of the game as well. 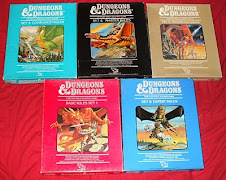 OD&D had Tiamat and Bamut as Divine Dragons and BECMI D&D had the Dragon Rulers. Dragonlance took the concept even further with having both Draconic Gods, but also mortal dragons as messengers of the Gods. In my Blackmoor campaign I decided I wanted to explore this idea of humans viewing dragons as part of the divine. In this case, I decided to use the Peshwah Horsemen. Since I take some inspiration for the Peshwah from the Fremen in Frank Herbert's Dune series, I thought of the idea of using Dragons as a parallell to the Sand Worms of that series. The Fremen view the Sand Worms or Shai Hulud, as the manifestations of God; their actions being those of reverence, no matter how destructive. My idea was to make the Peshwah feel the same way about Dragons. Additionally I decided that the Peshwah would not distinquish between Good and Evil dragons. All dragons to them are sacred. In the last session, my players took the concept even further than I had anticipated. One of the player characters had his arm destroyed by dragonfire, only to have it replaced by a clockwork arm. Upon learning this, another player, playing a Peshwah Monk of the Fallen Star (See Dave Arneson's Blackmoor D20 for details), declared that the fact that the character had his arm destroyed by a dragon was a mark of the divine. He believed that the character was Dragontouched, an individual meant for a greater purpose. Introducing the Dragontouched to the Peshwah clan of the Adiel, this character was met with reverence. This could be the thing that could help the PCs convince the Peshwah to join with Blackmoor in the ongoing War against the Egg of Coot. And the war is not looking good for Blackmoor right now. I have always pictured Dragons as acting like cats...you know, preening, confident, all other creatures are there to serve? Solid idea -- and Herbert is an interesting connection to make. Chinese mythology especially would be a good source for ideas about divine dragons.